Is it too much a cliché that the barber in this RPPC is Italian? 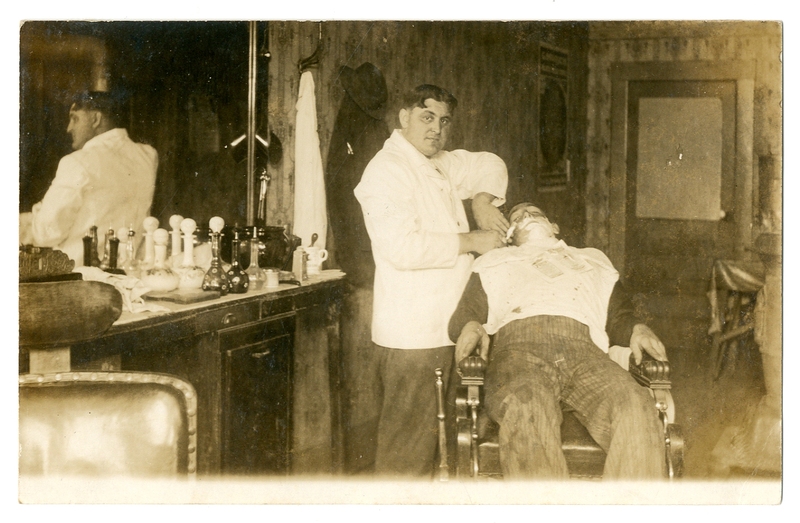 Further populating Agincourt with the fullest complement of butchers, bakers, makers of candlesticks, etc., I acquired this postcard of a barber give one of his patrons a shave. Penciled lightly on the back is the name “Giuseppe Parano” but without postmark or any additional information. Ancestry.com confirms someone with a similar name: a U.S. draft card puts Giuseppe Peirano, Italian-born in 1881, at Framingham, MA, but you know what happened to emigrants’ names when passing through Ellis Island. Somehow, this gentleman will have a shop on Broad Street, eventually, and a satisfied clientele. By agincourtiowa in Uncategorized on Wednesday/01/July/2015 .